Dr. Wilke was born and raised in Columbia, Tennessee. 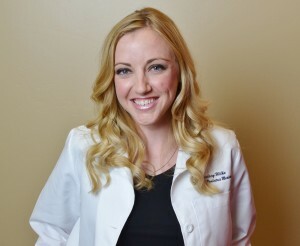 After receiving her Bachelor’s Degree at Middle Tennessee State University, she completed her Doctorate in Podiatric Medicine from the Arizona School of Podiatric Medicine at Midwestern University in Phoenix, Arizona. She then completed her surgical residency at the Carl T. Hayden VA Medical Center in Phoenix, Arizona. During this time Dr. Wilke acquired extensive experience in many facets of podiatric medicine and surgery with specific emphasis on diabetic foot care and limb salvage as well as rear foot and forefoot surgery. She had the privilege to train under Dr. Robert Frykberg, a world-renowned diabetic foot expert, and had exposure to cutting-edge procedures and products in managing a diabetic foot. She enjoys providing personalized care for injuries, diseases and many other conditions of the foot, ankle and lower leg. Her goal is to provide you with the highest quality care and to collaborate with you on the range of options available – from routine office procedures to surgical procedures when necessary. Some of her specialties include: Bunion and Hammertoe correction, plantar fasciitis, and geriatric foot care. Dr. Wilke is also an expert at custom molded functional orthotics that can treat a variety of foot aliments and get you back on your feet. Dr. Wilke is licensed to practice in the state of California.